BANGKOK (AP) — Thai soldiers and police fought pitched battles Saturday night with anti-government demonstrators in streets enveloped in tear gas, but troops later retreated and asked protesters to do the same. Five people have been killed, including a foreign journalist, and nearly 500 wounded, according to hospital officials. The army had vowed to clear protesters out of one of their bases in Bangkok by nightfall, but an Associated Press photographer said the push instead set off street fighting. He said there was the continuous sound of gunfire and explosions, mostly from Molotov cocktails. After more than two hours of fierce clashes, soldiers pulled back. Army spokesman Col. Sansern Kaewkamnerd went on national television Saturday night to ask the protesters to retreat as well. He also accused them of firing live rounds and throwing grenades during the fighting. "The security forces have now retreated to a certain extent from the red shirts," Sansern said. He said a senior government official has been asked to coordinate with the protesters "to bring back peace" and urged them to back away to avoid more violence. Four protesters and a Japanese journalist who worked for Thomson Reuters news agency were killed, said Pichaya Nakwatchara, the director of BMA General Hospital. He said most appeared to have been hit by hard objects on the head and some had gunshot wounds. Protesters marched the body of a man they said was killed in the fighting to one of their encampments. They carried the man — who had part of his head blown off — on a stretcher. The injury toll for the day rose to 486, according to the government's Erawan emergency center. There were reports that several people sustained gunshot wounds. The army said any live rounds were fired only into the air, but confirmed that two of its soldiers had been shot. 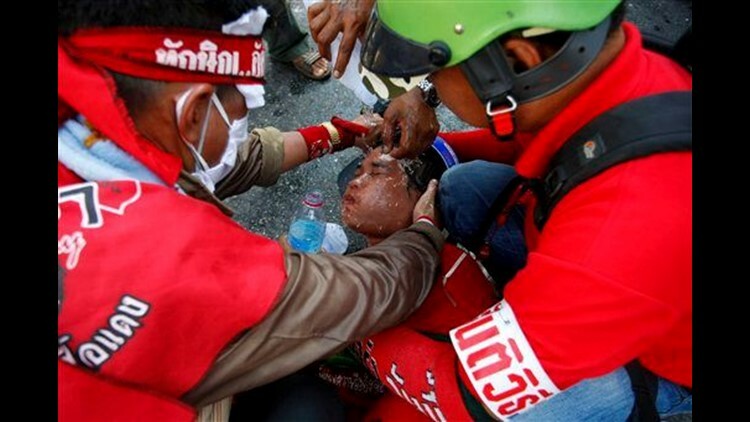 Government spokesman Panithan Wattanayakorn said more than 60 forces had been injured. The Red Shirt protesters are demanding that Prime Minister Abhisit Vejjajiva dissolve Parliament and call new elections. Their demonstrations are part of a long-running battle between the mostly poor and rural supporters of former Prime Minister Thaksin Shinawatra, and the ruling elite they say orchestrated the 2006 military coup that removed him from power. The Red Shirts see the Oxford-educated Abhisit as a symbol of an elite impervious to the plight of Thailand's poor and claim he took office illegitimately in December 2008 after the military pressured Parliament to vote for him. Most of Saturday's fighting took place around Democracy Monument, which is near one of the encampments of the Red Shirt protesters. But it spread even to the Khao Sarn Road area, a favorite of foreign backpackers for its cheap guest houses. Soldiers made repeated charges to clear Red Shirts, while some tourists stood by watching. Two protesters and a Buddhist monk with them were badly beaten by soldiers and taken away by ambulance. Red Shirt leaders at a second rally site in the capital's main shopping district said they were leading followers to reinforce their comrades at the site of the fighting. Government forces have confronted the protesters before but pulled back rather than risk bloodshed. On Friday, the army failed to prevent demonstrators from breaking into the compound of a satellite transmission station. The humiliating rout of troops and riot police raised questions about how much control Abhisit has over the police and army. To effectively confront the protesters, Siripan Nogsuan Sawasdee of Chulalongkorn University said the government needs the cooperation of the military, but it could be that the army is reluctant to use force against the protesters. Thailand's military has traditionally played a major role in politics, staging almost a score of coups since the country became a constitutional monarchy in 1932. On Saturday afternoon, army spokesman Col. Sansern Kaewkamnerd said that the military planned to clear out the protesters from their original rally site in the old section of Bangkok by dusk. More troops were also sent to a second rally site in the heart of Bangkok's tourist and shopping district. The city's elevated mass transit system known as the Skytrain, which runs past that site, stopped running and closed all its stations. The deployment came after protesters were pushed back by water cannons and rubber bullets from the headquarters of the 1st Army Region. Although they have two main rally sites, the Red Shirts use trucks and motorcycles to send followers all over the city on short notice. On Friday, protesters broke into the Thaicom transmission station and briefly restarted a pro-Red Shirt television station that had been shut down by the government under a state of emergency. After scattered hand to hand scuffles, the troops retreated in disarray, some taking positions inside the main Thaicom building. Merchants say the boisterous demonstrations have cost them tens of millions of baht (millions of dollars), and luxury hotels near the site have been under virtual siege. Associated Press writers Denis D. Gray and Thanyarat Doksone contributed to this report.